Translation: It's an absolute beast on four wheels instead of six. Mercedes-Benz claims it’s not quite a production model, preferring to call it a "near-series concept." 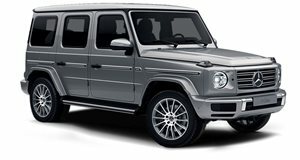 But it’s quite clear the German automaker has every intention to build the G 500 4x4 Squared, essentially the famed G 63 AMG 6x6 without one of the axles. We’re sold already. Like its six-wheeled counterpart, the G 500 4x4 Squared features massive 22-inch wheels complete with off-road tires, stainless steel underbody guards, side exhaust, and permanent all-wheel drive. 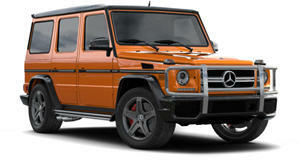 There’s also an AMG front bumper, carbon fiber wheel flares, and LED strip lights above the windscreen. Power comes from the familiar 4.0-liter bi-turbo V8, churning out 422 hp. Mercedes didn’t provide exact performance numbers, only claiming that this engine will meet Euro 6 emissions standards. What makes the G 500 4x4 Squared special is the fact that it has portal axles and a retuned suspension which Mercedes claims results in "merciless driving dynamics in all conditions." Sand dunes, rocky terrain, water? None of these are problems when there’s 17.7 inches of ground clearance, a fording depth of 39.3 inches, and approach and departure angles of 52 degrees and 54 degrees, respectively. As opposed to the conventional rigid axles, the wheels here are not at the height of the center of the axle. Instead, they are situation further below the axle heads due to the portal transmission. Details are few regarding the interior, but Mercedes did point out that the 4x4 Squared comes with the designo Exclusive package, featuring seat bolsters, head restraints, center console, and armrests styled in black designo leather with white contrast stitching. The seat surfaces and door trim are covered in Dinamica microfiber. A more detailed reveal is expected shortly, quite possibly at Geneva.